Providers of UK annuities could increase rates as 15-year gilt yields are 29 basis points higher and investors selloff US bonds following speculation the Fed will rause interest rates. US government bonds are leading the way increasing to their highest level since Britain's EU Referendum following speculation the Federal Reserve will increase interest rates resulting in a global bond selloff. In addition the European Central Bank (ECB) also signalled they intend to be less committed to extending the European Union stimulus programme resulting in a selloff in European bonds. 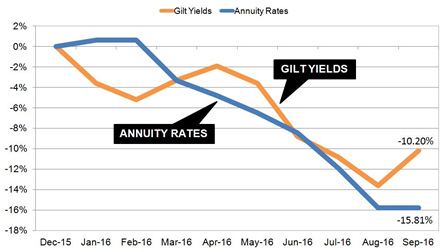 In the UK the 15-year gilt yields are higher by 29 basis points and as annuity rates are mainly based on gilts it is likely there will be a recovery in rates. 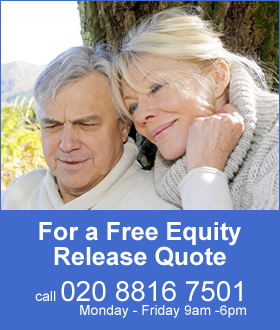 As a general rule a 29 basis point rise in yields will result in a 2.9% increase in rates, however, annuities were lower last month so providers have the opportunity to make improvements of 5% or more depending on age and features added to the annuity. Annuity rates have decreased over 15% in 2016 following the ECB quantitative easing and the EU Referendum result. The above chart shows our benchmark rate for a person aged 65 with fund of £100,000 buying a single life, level annuity. 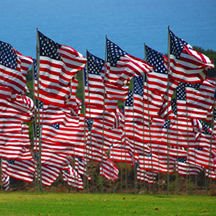 Annuities have declined during the year with rates lower by 15.81%. The 15-year gilt yields were lower by 13.60% in August and have since recovered and down by 10.20% for the year. This suggests our benchmark rate can increase by about 5.61% at some point if yields remain at or above current levels of 1.27%. This compares to their all time low reached on 11 August of 0.90%. Will the bond selloff continue? The Federal Reserve may have a reasonable case to be made for a gradual rise in interest rates according to some Fed officials. Some analysts have commented that weak US economic growth annualized at 1.1% this year suggests the Fed will leave rates as they are in September. In Europe the ECB at their latest meeting on Thursday did not have discussions to extend the life of the quantitative easing programme and there are concerns that the Bank of Japan is also reaching the limits of its bond buying programme. In the UK improved economic expectations have also suggested the Bank of England has less reason to increase its stimulus approach and Chancellor Philip Hammond may reverse aspects of austerity with a fiscal policy to stimulate the economy. In the US the major party presidential candidates have also discussed fiscal spending to boost global growth. A short term rise in annuity rates is possible although it may take more time for the providers to decide in raising rates in the long term until we see more evidence of an actual shift in policy with less monetary and more fiscal policy.